It is a bittersweet night here at StatHat as we have to say goodbye to one of our oldest, most hard-working friends: api-ssl-balancer. api-ssl-balancer was born on March 18, 2011 at 10:47:00 AM UTC-5. It has been the endpoint for api.stathat.com since the beginning. Every single data point on StatHat has gone through its gates: 9.76 trillion requests and counting. In these days of cloud computing where servers are ephemeral and only up for a few hours or days, we don’t have relationships with our servers. They are no longer cleverly named after natural disasters or bivalve mollusks. But although it doesn’t have a fancy name, api-ssl-balancer has been around and unchanged for almost 7 years. Through thick and thin, api-ssl-balancer has always worked. Over the years, several availability zones have gone dark, EBS stopped working for a day, EC2 instances failed to launch, even good old S3 was unavailable. But api-ssl-balancer, you’ve always been there, quietly sending HTTP requests along to our servers. You’ve been connected to all the availabilty zones: us-east-1a, b, c, d, e, and f. Countless servers in your autoscaling group have come and gone. When you were created, there was no HTTP/2 or SPDY. We couldn’t even point a root DNS record at you. You’ve been around so long that you are officially called “Classic”. We know you understand. We need the new instance types. We need the enhanced network performance. HTTP/2 will be nice for our users (and hopefully our bandwidth). So last night, we changed the DNS record for api.stathat.com to point to a so-called application load balancer that supports HTTP/2 in front of a VPC network. But even after the TTL of 3600 seconds went by, api-ssl-balancer wouldn’t let go, or maybe its friendly clients couldn’t believe that after 7 years the name was pointing somewere else. 24 hours later and you still have 1,500 active connections and are handling 700,000 requests per minute. With heavy hearts we’re going to have to turn you off and force your clients to connect to your new sibling. Goodbye, api-ssl-balancer…thank you for all the requests. StatHat can now send alert notifications to Keybase team chat channels. Since team chat on Keybase is end-to-end encrypted, we can’t just post a message to some API endpoint like we do for Slack and PagerDuty. You need to add our bot user to your team. 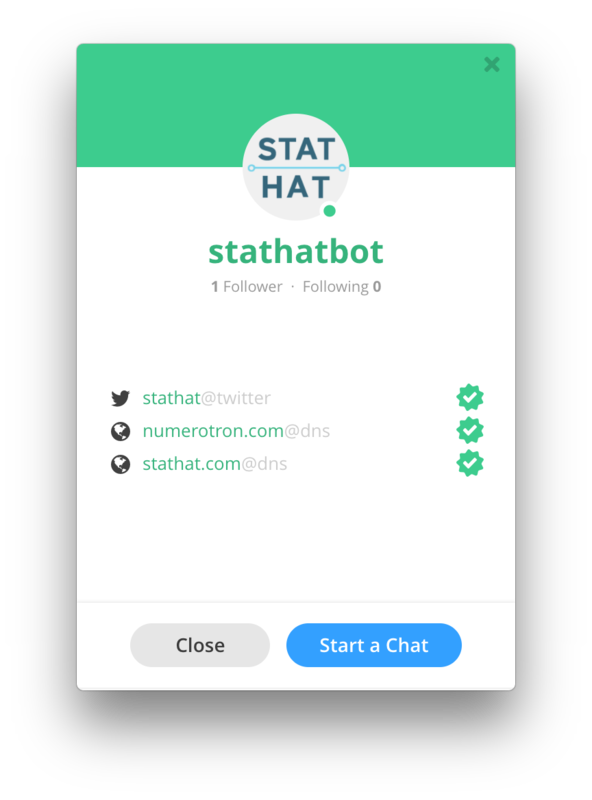 It should have valid proofs for @stathat on twitter, DNS for stathat.com, and DNS for numerotron.com. Given those proofs, you can be confident that stathatbot belongs to us here at StatHat. You can follow stathatbot to keep track of its proofs and notice any changes. The reader role is a little confusing, but it means that it will only have read access to any files you happen to put in /keybase/team/treeehouse.alerts. It can still read and write to any chat channel in treehouse.alerts. (For the record, the stathatbot doesn’t even have file system access turned on, but you should still give this bot as little access as you can.) You will need to add yourself and anyone else that wants to see the alerts to the subteam. Now, you’re all set on the Keybase side. In StatHat alert destinations settings, there’s a new section for Keybase. You would enter treehouse.alerts for the team name and you can leave the channel blank to use the default general channel. Once you enable this Keybase destination for manual and automatic alerts on the main settings page, all alert notifications will be sent to your Keybase team’s chat channel. Let us know if you have any further questions or issues setting this up. P.S. If you’re curious how this works: we have an isolated server where there’s a user logged in to Keybase as stathatbot. There’s some code pulling alerts off of an SQS queue. When it gets one it uses keybase chat api to send a message to the appropriate team/channel. It’s pretty small. 152 bytes. But users sent in 150 billion requests last month, and StatHat responded with that 152 bytes to them all, which is 20 terabytes. It is 25 bytes (maybe 26 with a blank line after the header), 127 bytes leaner. So let’s just pretend we don’t have a good clock. None of the official StatHat libraries look at the body of the response, they just care about the 2xx success status. We have tried this response in production on a subset of the requests and have not received any reports of it being a problem, so we are rolling it out for all requests. Note that we will still provide details for multiple stats uploaded in a JSON request and any error cases. If you have code that parses the original body and would like to continue doing so, include a vb=1 request parameter with your POST or GET request and the servers will respond with the original verbose body output. This change should remove about 17 terabytes of useless data from the internet pipes each month. 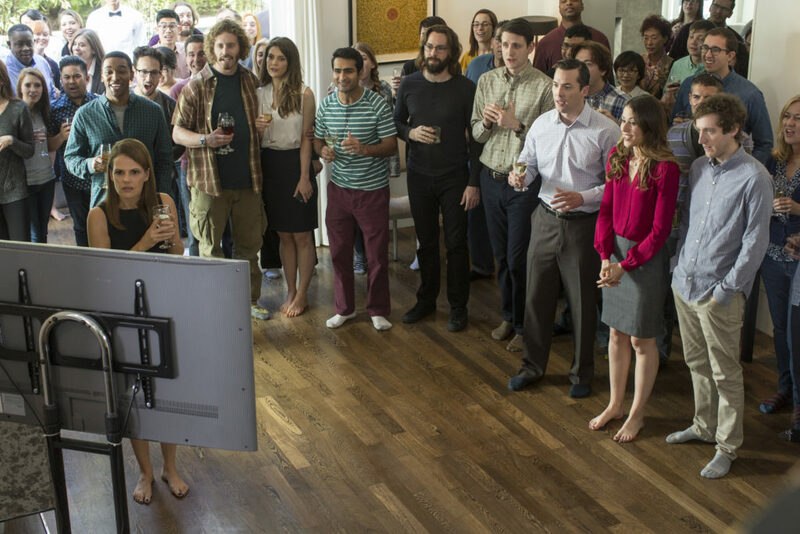 Is Pied Piper using StatHat? No, of course a fictional company on a TV show isn't using a real service like StatHat.1 But it sure looks like they are. 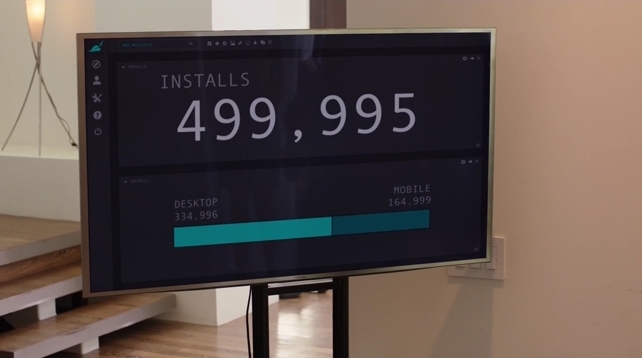 Season 3, Episode 9 Daily Active Users was all about two stats: Installs and Daily Active Users. Tracking these with StatHat would be a piece of cake. Those two calls to StatHat are all it takes to track these stats. They don't need to be created on the website first as StatHat will create new stats dynamically when it receives a new stat name. The installs stat is a counter. 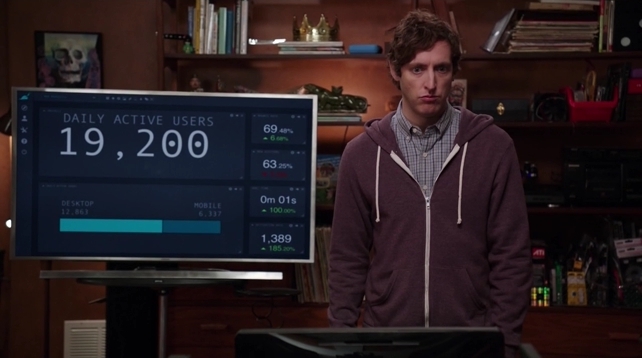 Every time someone signs up for Pied Piper, it sends a count of 1 to StatHat. StatHat will then sum these up over time. The daily active users stat is a value. Every minute, the cron script sends the current daily active users value to StatHat. StatHat will then average this value over time. Now that the data is going to StatHat, there are many options for viewing it. 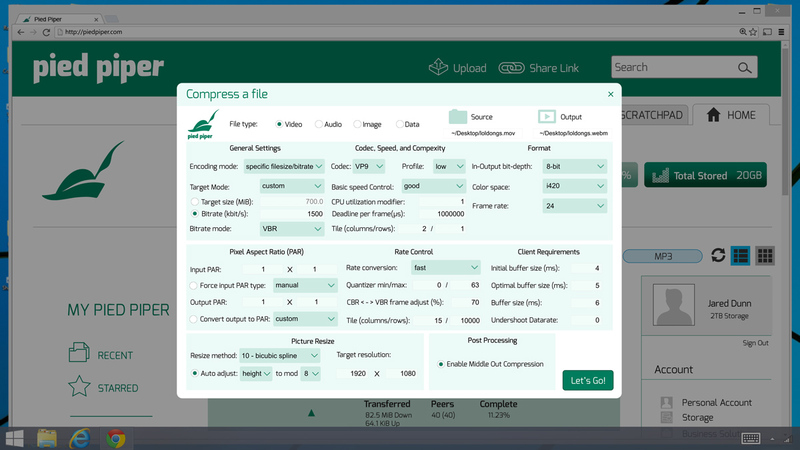 The web interface allows you to inspect the data at any timeframe, compare multiple stats. It also has cards that would be an easy way to create a dashboard of Installs and Daily Active Users. Or Panic's Status Board would be another easy choice. That's all that is needed. You should see the number displayed above change every minute. Since this stat is a counter, StatHat is displaying the total count received over the timeframe. 1: Betteridge's law of headlines is true in this case. We built it a long time ago and StatHat has been using it to include charts in alert and report emails. While we told a few other companies about it, we never officially announced it. All the documentation for it is on the main page at chartd.co.